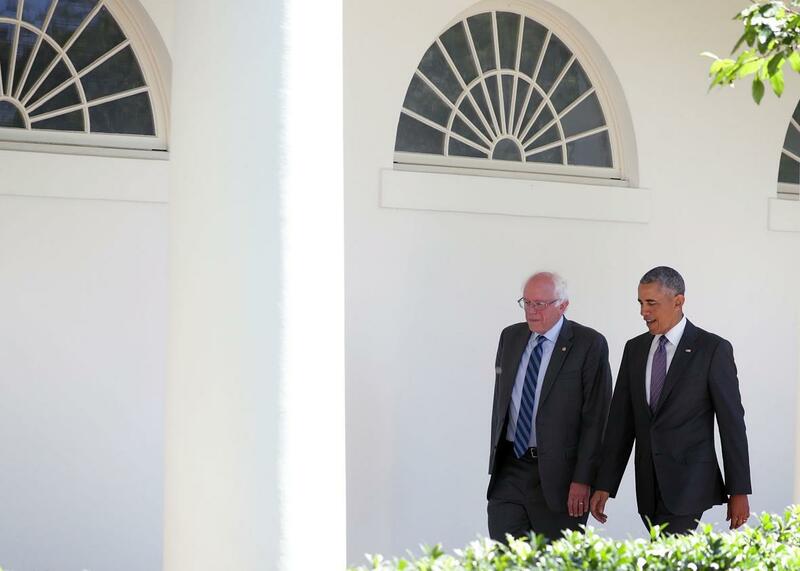 Bernie Sanders' visit with Obama ends in good news for Democrats. Sen. Bernie Sanders walks with President Barack Obama through the Colonnade as he arrives at the White House for an Oval Office meeting Thursday in Washington, D.C.
Bernie Sanders met face-to-face with President Obama at the White House on Thursday, after which Sanders gave nervous Democrats a handful of reasons to exhale. While the Vermont senator made it clear that he’s not packing it in just yet, he sounded like a man now ready to help unify the party behind Hillary Clinton ahead of the general election. Sanders didn’t take any questions from the throng of reporters who were waiting outside the West Wing for him, but his carefully worded statement contained plenty of tea leaves for pundits and politicians alike. For instance, here is how he talked about economic inequality and college debt: “These are some issues that many millions of Americans have supported during my campaign,” Bernie said. “These are the issues that we will take to the Democratic National Convention in Philadelphia at the end of July.” Notice the promise to fight on—but in the name of his chosen issues, not his presidential candidacy itself. It’s unclear what exactly transpired during his meeting at the White House, but Sanders began his speech by thanking Obama and Vice President Joe Biden for their “impartiality” during the primary. (Update 2:16 p.m.: Shortly after the meeting, Obama officially endorsed Clinton for president.) Bernie said that he plans to speak with Clinton in the near future “to see how we can work together to defeat Donald Trump and to create a government which represents all of us and not just the 1 percent.” He may not be ready to call it quits just yet, but those are the words of a man who is well aware of the need to convince his passionate base to get behind Hillary. Sanders vowed to compete in next week’s primary in the District of Columbia—the final nominating contest on the Democratic calendar—which is in line with his long-held promise of staying in the race until every voter has had the chance to cast a primary ballot. And it’s clear he plans to continue to flex his political muscles to push the Democratic platform left, and maybe even change the nominating process in order to make insurgent campaigns like his more competitive in the future. We haven’t heard the last of Bernie by any means. But on Thursday he sounded like a man who’s ready and willing to work within the Democratic Party, not tear it apart.